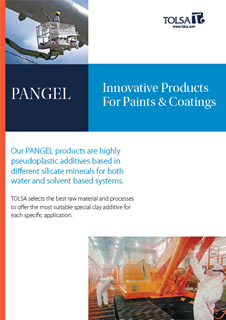 PANGEL® B20 by Tolsa is a powdered rheological additive with a high thickening and anti-settling capacity for intermediate polarity systems. Imparts thixotropic, suspension and sagging-resistance to systems based on aromatic and unsaturated polyester type solvents. Also provides a strong pseudoplastic character, producing high consistency levels without affecting viscosity during application. Suitable for use in printing inks where it improves consistency and prevents settling of pigments, in coatings and paints preventing- settling of pigments and fillers, sagging without aggravating levelling, in asphalt coatings providing- high thickening capacity, sagging control. 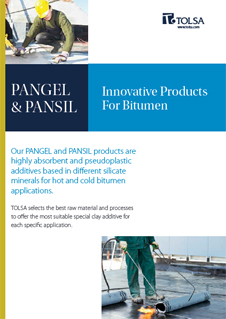 Market applications of PANGEL® B20 include decorative enamels, alkyds, coatings for lower part of car, signalling, marine coatings, automobile priming oven-cured enamels, epoxy, epoxy 2K with high solid content, urethane, nitrocellulose based varnish, water soluble paints, newspaper black ink, heat-set, nitro-based inks, engraving inks.